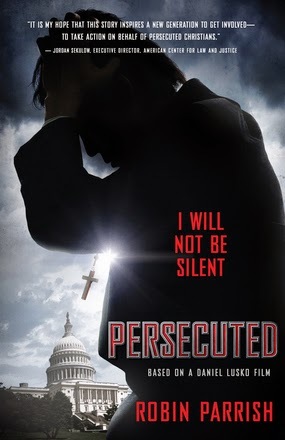 "Persecuted", by Robin Parrish is a novelization of the upcoming Daniel Lusko film which will be in theaters this summer. John Luther is an evangelist who ultimately wants to share the Gospel. John's ministry is built on the message of redemption. He unashamedly states he is a sinner saved by grace and transparently shares that has made numerous mistakes in his past. But, John's past comes back to haunt him when his reputation is brought into question by those hoping to destroy his ministry. John is asked to give his support for a new religious equality bill. When he refuses to endorse this bill, the powers that be decide to frame him for murder to get him out of the way. John becomes a fugitive as he searches for the truth to clear his name. Once I got past the prologue -- which focuses on the assassin's point of view -- the rest of the novel was more to my liking. The novel has flashback chapters that highlight John's troubled past, his tumultuous relationship with his father and his conversion. These flashback chapters give insight into the present day and to the current circumstances. Overall this novel was thought-provoking in that it deals with standing up for the Truth no matter the cost and the touchy issue of tolerance-turned-equality. One of the antagonist of the novel declares: "... Christians and Jews and Muslims standing together in solidarity... this is the future of our evolution in this nation..." But, loving others (as the Bible instructs us to) and joining with other faiths in solidarity are not the same. I've heard so much about tolerance lately -- for everyone, but Christians that is. Christians should not be accused of intolerance because we hold fast to what we believe and to what God's Word says is the Truth. Hopefully this novel will inspire Christians to be prepared to stand up for Jesus and for the redemptive power of His death and resurrection. The novel is full of action and suspense and I look forward to seeing the movie when it come out. Win it: One Sowing Dandelion Seeds reader will win a copy of the book "Persecuted". I usually enjoy the novel more than the movie! I have had to take a stand on my feelings against abortion many times in the past. Angela, that can be a lonely stand to take, but standing up for what's right is so important. I usually prefer novels over movies. II usually like the novel better than the movie. Once I read the novel, I have it set in my mind exactly how it should be, and the movie obviously doesn't match my mind. I usually love the movie better. I love to see a book turned into a movie. I definitely prefer the book over the movie. I create the scenes and characters in my mind and the movie rarely comes close!!! I love the novels better than the movies.Maybe I have a wild imagination but as a rule the movie is never as good when I see it. I stood up for what I believed in when I returned a wallet I found to its rightful owner with everything intact. Thanks Wanda! As someone who's had their wallet returned in full I'm glad that world has people like you in it! It depends what the category is. I like drama better in novels! I find that I generally prefer the books over movies. A book has no time limit so you are able to get to know the characters much better. I try to stand up for what I believe in all the time. When done properly and calmly, I feel it sets a good example for my daughters. I will always make a stand against bullying. I do love movies, but if it is a movie that there is also a novel for, the book has always been better for me. I have had to go to court and testify against an attacker. It was very scary and difficult, but I knew it was the right thing to do, to go and tell my story. Candice, that would have been so scary! I'm glad you testified and held the person responsible for their actions! I prefer novels to their films because something usually is left out of the movie that was in the novel. I support our troops that is a time I have stood up. I usually prefer the books to the movies -- there are some exceptions! The Help is one of them! I normally like the book better than the movie. But occasionally, there is a story that is told very well on the big screen. I prefer to read the book over the movie. If I am going to do both, I'd rather read the book first. Thank you! In 9th grade, I refused to dissect a frog. I was given a computer program version with an assignment to complete with the highest possible score being a C.
I think I like the book more than the movie, generally...it usually has more details and more storyline that the movie doesn't show...plus you can go into the mind and motivations of the characters easily, which can be hard in a movie. Depends on the movie/book. There have been books I liked their movies better and a few movies based on books that were SOOOO horrible, terrible and bad (Queen of the Damned anyone?). I don't think that's something I'd consider reading or watching... But, I do agree that it depends on the movie/book. I usually like novels better than their movies. If the book is well-written, there is so much more to the book usually than the movie! I enjoy novels better than the movie. I stand up for our Vets who have bravely served our country. Novels are ALWAYS better than the movies!